1 Heat butter and oil in a large skillet over medium-high heat. Add gnocchi and cook until browned, about 5 minutes. 2 Add beans, sage and water. Cover and simmer until the gnocchi are tender and the beans are heated through, about 5 minutes. Season with salt and pepper. 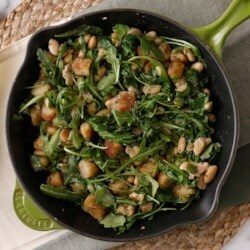 Serve over arugula.